A two-time CrossFit Games competitor and former collegiate football player, David Borrelli has been working in the fitness industry since 2009. After graduating from the University of North Carolina at Charlotte with a degree in exercise science, David served as the head coach at Rising CrossFit Ballantyne from 2013-2018. 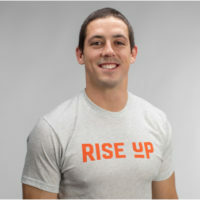 Rise Up’s other head coach, David coaches a variety of classes, including CrossFit, bootcamp, and weight training. Additionally, he created and will be offering nutrition seminars and classes throughout the calendar year to all Rise UP members. Dave has been married to his wife Jenna since 2014 and the couple reside in South Carolina with their growing family.